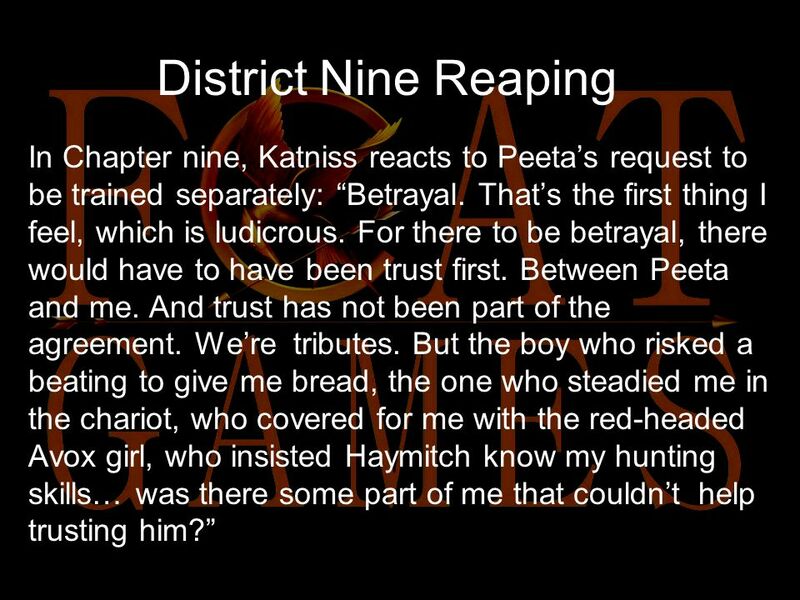 District Nine Reaping In Chapter nine, Katniss reacts to Peeta’s request to be trained separately: “Betrayal. That’s the first thing I feel, which is. 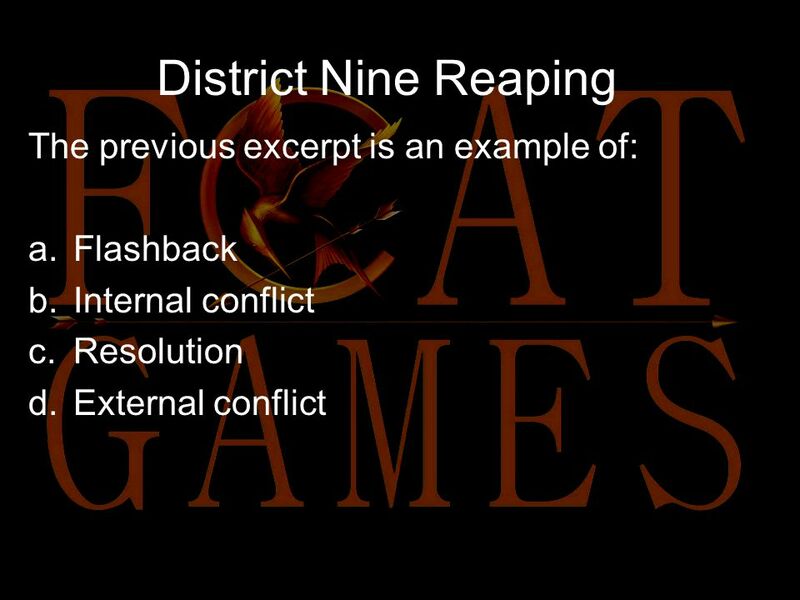 Download ppt "District Nine Reaping In Chapter nine, Katniss reacts to Peeta’s request to be trained separately: “Betrayal. That’s the first thing I feel, which is." District Six Reaping Read the excerpt: As we step into the cool, windy, evening air, I catch my breath at the view. The Capitol twinkles like a vast. Elements of Fiction Short Story Unit. 1/8 AND, OR and NOT b How many boys? b How many girls? b How many blue? b How many red? Faction Three: Dauntless Read the excerpt from the passage: When I look at the Abnegation lifestyle as an outsider, I think it’s beautiful. When I watch. District Four Reaping Read the excerpt: The tunnel goes on and on and I think of the tons of rock separating me from the sky, and my chest tightens. Elements of a Short Story Mrs. Smith – English 9A. Author: Suzanne Collins Year Published: 2008 Genre: Science Fiction Presentation by: Emily Arnold. 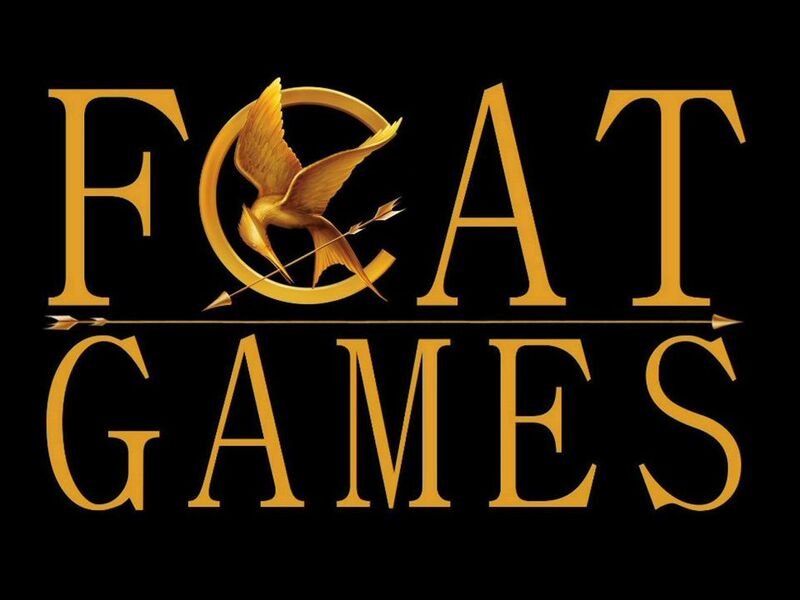 The Hunger Games By Suzanne Collins Continued…. The next group of slides are visual aides for the story. Progress as you read (and no further) otherwise. 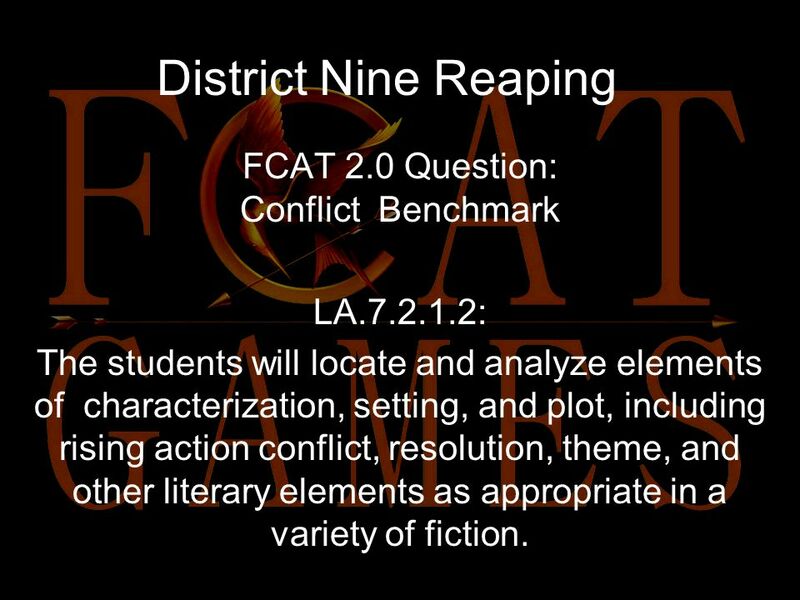 District Eight Reaping Read the excerpt: I can’t help comparing what I have with Gale to what I’m pretending to have with Peeta. How I never question. Story Elements Keys to Understanding. Literary Terms Elements of a Story 6 th Grade Pre-AP Lang. Arts. Characterization & Character Types Why do we like or dislike characters? By Orion Saah. Plot development: man v.s man and man v.s society 24. Plot: The most important element. Plot The sequence of events in a story. Without a plot, you have no story. There are five elements.